Ahead of missile talks with President Obama this summer, Russia puts on combat duty new radar stations. Three events took place in May at nearly the exact same time: Russian Security Council Secretary Nikolai Patrushev visited Washington and delivered Vladimir Putin’s response to President Barack Obama’s letter; the international conference on Military and Political Aspects of European Security was organized by Russia’s Ministry of Defense and held in Moscow; and Defense Minister Sergei Shoigu visited Kaliningrad Region, where the Voronezh-DM early warning radar and ranging system was put on trial duty. Standing at the center of all these events was the U.S. missile defense program, which the Pentagon intends to place practically at Russia’s very doorstep. Although Obama’s letter to Putin contained some serious proposals aimed at quelling the concerns in Russia that the U.S. missile defense system in Europe may affect the state of the country’s strategic deterrent forces, the Russian president made it clear in his reply — if the Kremlin press service is to be believed — that he considers these guarantees to be insufficient and insists on legally binding commitments. Experts point to the fact that presidential terms come to an end, and there are no grounds to believe that the next incumbent will keep the promises of his predecessor. This was the opinion at the international conference on security in Moscow. NATO’s assurances that the European missile defense system will not be directed at Russia are worthless, Russian experts argue, so long as an agreement limiting the activities of missile defense systems to the borders of NATO member countries — and not an inch further — is not reached. Otherwise, Russia will be forced to take asymmetrical (but highly effective) measure to neutralize this missile defense system. He stressed that implementing this system of neutralization would depend on Russian assessments of the extent to which U.S. and NATO missile defense may weaken the potential of Russia’s nuclear forces. In order to show that this is no bluff (and, at the same time, test the missile defense system in the west of the country), Defense Minister Sergei Shoigu headed to Kaliningrad Region to check out the Voronezh-DM early warning radar and ranging system. It also covers an airspace radius of 3,728 miles, including the Middle East and a large section of the Indian Ocean; and it is a lot cheaper to operate. 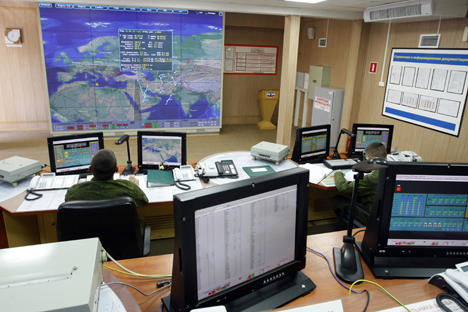 It should be noted that the Voronezh-DM early warning radar in Kaliningrad is set to be put on combat duty in late 2014. The station itself monitors North Africa and the Mediterranean Sea as far as the Atlantic Ocean, which includes the areas patrolled by American, Ohio-class submarines with strategic missiles. It covers a radius of 3,728 miles over the Earth’s surface and 4,970 miles into space. Russia has similar stations in Armavir (to be put on combat duty in June of this year), Lehtusi near St. Petersburg (already operational) and in Siberia, near Irkutsk (the first radar is operational, while the second is still under construction). There are also early warning radar systems in the Kola Peninsula (Dnestr-M and Daryal radars), the Komi Republic (Daryal radar), Belarus (Volga radar) and Kazakhstan (Dnepr and Dnestr radars). Until recently, Azerbaijan also had an early warning radar system (Daryal-type), but it has been deactivated and will share the fate of Ukrainian radar stations. From now on, new early warning radar systems will be built on Russian territory only. Further stations are set to be put into operation in Barnaul, Omsk, Yeniseysk and the Orenburg region by 2018. Mobile, multifunctional, adaptive early warning radars under the codename “Mars” are currently under development — again, with full readiness and a high degree of versatility. They can be used in early warning radar systems, as well as for space surveillance, missile defense and non-strategic early warning systems both on the ground and on ships, in the form of basic information tools for aerospace defense zones and regions. They can also be used as a high-precision measuring instrument in testing areas and on space ports. The radar system has a number of advantages over its competitors. First of all, it is relatively cheap: Construction of the Daryal-type radar in Qabala (Azerbaijan) cost the Soviet government $1 billion, while the Voronezh radar in Kaliningrad set the Russian government back a paltry 1.5 billion rubles (around $46.6 million). Secondly, construction times are significantly reduced, with the new station being up and running in as little as 1.5–2 years, compared with the 10 years it used to take. The new stations also consume less energy (0.7–2 megawatts), in stark contrast to the 50 megawatts used by the older models; this means that money is also saved on cooling apparatus. And it goes without saying that the Voronezh-type radars are quicker and more accurate than their predecessors in the detection of ballistic missiles, other airborne targets and spacecraft at both VHF and UHF. It is also important to point out that bases for soldiers, officers, contractors and their families are being built in the vicinity of the early warning radar stations. The minister of defense went on a visit to one of these bases in the village of Pionsersky near Kaliningrad. The servicemen and women seem to have everything they need to enjoy a comfortable life there. It is impossible to separate the concern for the safety of the country from the concern for the safety of people, and the construction of a Missile Attack Early Warning System radar field is just a part of that. What happens next very much depends on the meeting between Vladimir Putin and Barack Obama, which is scheduled for this summer. But one thing is clear — the interests and safety of Russian political and military leadership will be well looked after. First published in Russian in Nezavisimoye Voennoye Obozrenie.